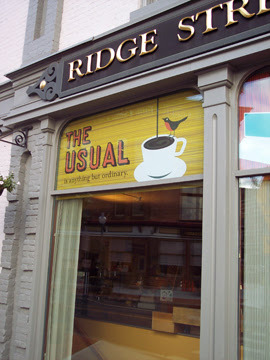 The Early Bird plays a starring role on the new Ridge Street Coffee Co. signage, installed this week. 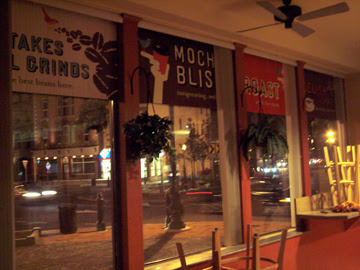 Singing the praises of fresh java and good eats out onto Centennial Circle. 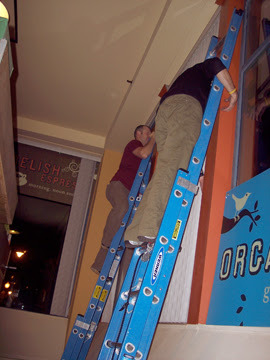 Derek and Sean play ladder-jockey. Special thanks to Trina and Raeanne for keeping things steady on the ground. 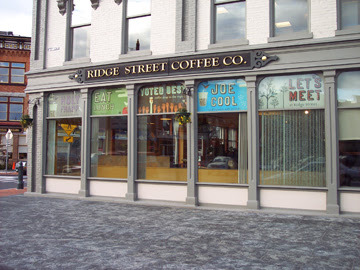 Let's meet at Ridge Street. So, it's been three months now since I was fortunate to join the Trampoline Design team as in-house Web Designer. While the principals here, Sean and Derek, have openly provided a crash-course in print design, explaining CMYK, letting me tag along at press checks, and giving me ample Illustrator training, today I have finally surmounted my duties as a Web designer: I've been granted access to the Bounce Blog. And it seems befitting to hack into the BOUNCE to announce the launching of Trampoline's latest digital venture: GigaBounce. What is GigaBounce? It's the missing piece of Trampoline's web presence, our online playground, web-experiment springboard, and hosting hub. It's the nucleus of our cyber-services. Now, in addition to offering complete Web design services, Flash design and development, PHP MySQL database programming, and custom content management tools, we ALSO can offer competitive Web site hosting. Which means, for clients, a more streamlined, organized, and hassle-free service. In other words, if you choose, we can do ALL of the leg-work for you. Which means I get to have more fun creating your Web site, so everyone wins! ... and a purpose. Keep checking GigaBounce for our latest distractions, web experiments, and other design oddities. Come here for news, visit our business site for the facts, and for fun... GigaBounce. Concrete. Like the sidewalk, except not. Anthony Armstrong is an anomaly. His talent is a weathered mixture of carpentry-meets-masonry-meets-hard work AND design-meets-drafting-meets-ideas that fit in an art gallery as much as they do a home. He is equal parts artist and entrepreneur. His medium of choice is concrete. His company is Armstrong Stone. The process of casting and molding concrete is highly detailed and offers a kind of customization not possible with other materials. The conference table here at Trampoline is concrete (thanks Anthony) and gets nothing but compliments. Anthony listened to our thoughts on color and texture, and shared his own ideas. 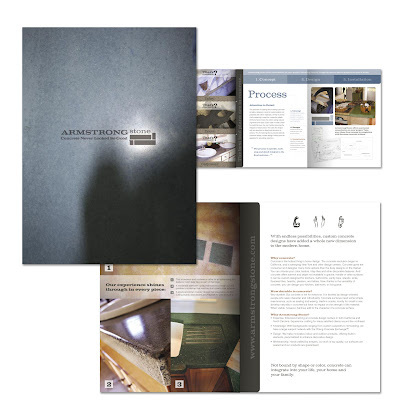 We reversed the process when Trampoline designed the Armstrong Stone logo, business system and capabilities brochure. Americade is the motorcycle rally that brings over 50,000 spenders-on-wheels to our neck of the woods. A typical attendee might not fit your everyday biker profile—many riders are retired couples enjoying the open road and looking for a little pampering after a hard day's ride. Less Orange County Choppers and more Bob Newhart. The above ad makes the case for staying at a resort that's timeless, elegant and always in fashion. 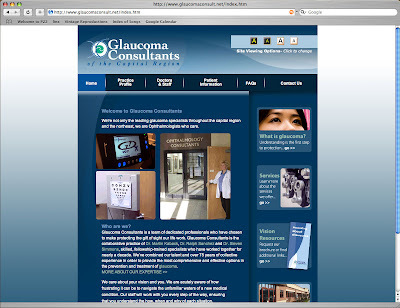 At long last, glaucoma consult.net is up for the world to see. The site is a patient-friendly resource that helps educate those suffering from glaucoma, their families, and even referring doctors. It's several sites in one, as there are 4 different viewing options. Considering the site from the audience's perspective, Trampoline researched glaucoma and found that some patients have an easier time reading white letters on a dark background, others the reverse. The new site offers options for both, as well as answers to frequently asked questions and information on Glaucoma Consultants of the Capital Region, the office that asked Trampoline to create the site. 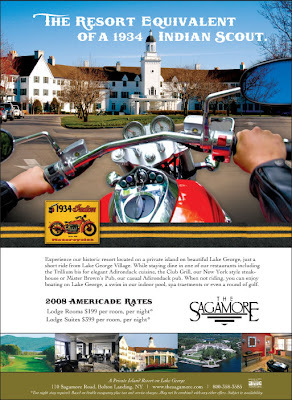 We just put the finishing touches on The Fund for Lake George annual report for 2006. The lake-saving organization has been in the news this year for collaborating with other agencies and municipal organizations to rehabilitate the former Gaslight Village Property. 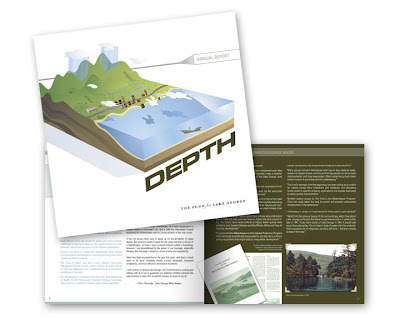 The report focuses on the depth of the Fund, and the commitment of those involved in the organization. 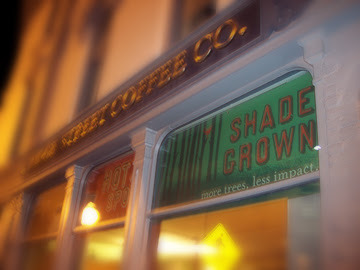 Here's hoping their positive impact on the watershed continues into 2008 and beyond. Trina: You're a Diva. Raeanne: I'm a Fan. Improvised Jam Session? Jump in Feet First! At the end of Friday's media night the Trampoline band shared the stage with Sara Messenger and Mik Bondy (aka the Human Jukebox) from Behan Communications, the incomperable Ray Agnew from the Glens Falls Hospital Foundation, along with two of our favorite newsmen: Maury Thompson from the Post Star newspaper (on piano) and Gordon Woodworth from the Chronicle. Together, we helped raise $750 for Feet First, a service organization dedicated to providing disadvantaged kids with the shoes they deserve. Jan and Jeannie, thanks for your kid-wrangling prowess. Jen and Blake, Trina lit up when she saw the two of you. Paula and Ben thanks for cheering on ol' Dad. Julia, enjoy the tambourine—your old man can show you how to shake it. Briar and Avery: the youngest (and cutest) groupies ever. Manda, thanks for getting the whole shebang on tape. John Yost, thanks for the bottle(s) of courage. Gary Poland, you raised a rock star. Todd Shimkus, the busiest man around. Hope you enjoyed the show. Nick Caimano, good luck on the campaign, congrats on the PAC endorsement. Bob Dillon, you're too cool for coming—stop in before you head up to Ad Workshop. And last but not least, Gary & Shirley Nelson...it seems like every time Trampoline hits a milestone—whether it's the very first conversation 'round a Vermont campfire, or an awards dinner, or a public performance like last night—you're always there cheering us on. We're helping the famous Utah ski area with their ski/demo shop advertising and marketing collateral. This is the first sneak peak. 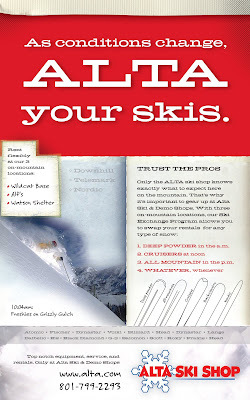 One of the coolest features at the Alta Ski Shop is their Ski Exchange Program - an anytime exchange of ski rentals, depending on what your likes/dislikes are, or if you're into condition-specific skis. Sounds like a pain, but not when there's three on-mountain locations. It also sounds unnecessary, but with 3' dumps of snow commonplace at Alta, this capability takes on a whole new meaning. When you find yourself hip-deep in the white stuff, it's time to "Alta Your Skis". Keep visiting us for more updates. We're so badass it's not even funny. Big show Friday. Big show. Won't Quit Our Day Job. Maury Thompson, a columnist at the Post Star Newspaper, is a nice guy. Convincing, too, as he talked us into performing in the first-of-its-kind Media Night. It's a cabaret of sorts, with newspaper men, graphic designers, account execs writers and creatives trading their various communication implements for instruments. The proceeds from the evening benefit Feet First, a program that puts disadvantaged kids in shoes. Seemed like a good reason to dust off the guitar and warm up the ol' vocal chords. But that was back in July, when Maury asked. Now the show is less than two weeks away. 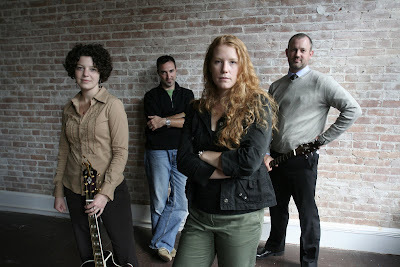 A recent conversation with our crosstown counterparts at Behan Communications revealed that half of their staff members are apparently full of musical talent—with the time and inclination to rehearse. And, Mark Behan is scheduled to be the master of ceremonies. Ray Agnew, #1 over at the Hospital Foundation, is also performing. He's, like, a folk rock icon around here. 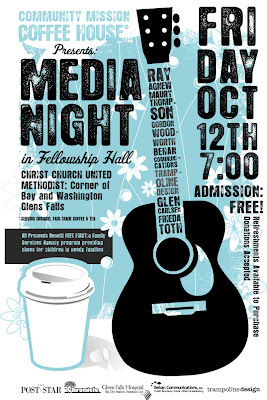 Stop by the Media Night, contribute to a worthy cause, hear what promises to be spectacular live music, and find out what we come up with. Maury wants four numbers out of us. Four! Jon Katz is known as a New York Times bestselling author. 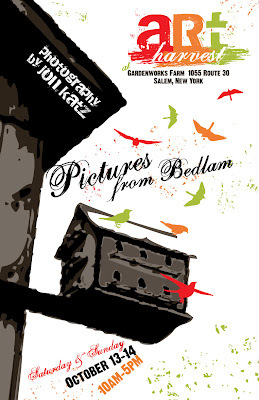 He also takes spectacular protographs that will be seen in the exhibit titled: Pictures From Bedlam. Anthony Armstrong has been a handyman for as long as anyone can remember. It wasn't until just recently that he discovered and developed a talent for working with concrete. 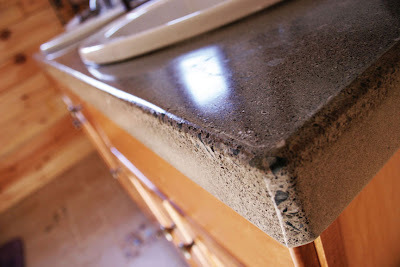 No longer Mr. Fix-It, Anthony spends his time designing, pouring and finishing functional works of art: countertops, conference tables and unique embellishments for the home. 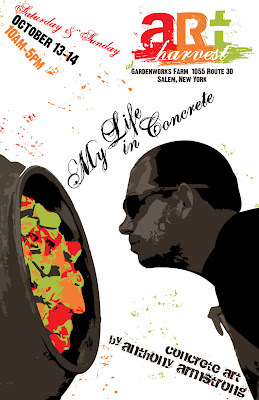 Anthony's exhibit: My Life in Concrete explores his journey to becoming an artisan. Maria Heinrich refurbishes historic homes with her husband Bill. But quietly, Maria has been creating fiber art, building a body of work. 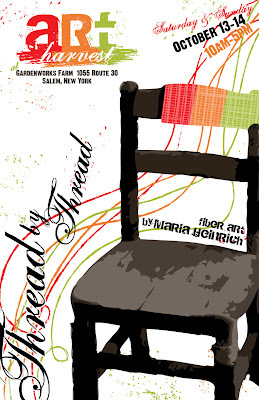 Her exhibit: Thread By Thread will show her painstaking creativity for the first time ever. Mary Kellogg is known for, well, for being a nice old lady. For years, Mary has been writing poems. 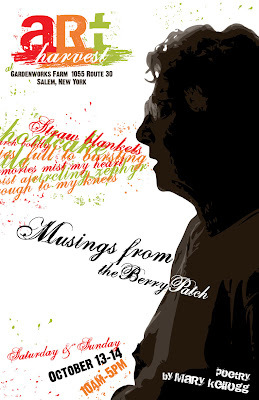 For the most part, she's kept them to herself—but in her exhibit, Musings From the Berry Patch she shares her words with us all. 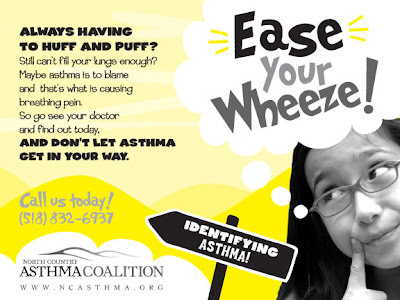 Our own dynamic duo, Trina and Raeanne, concocted an ad campaign for the American Lung Association. 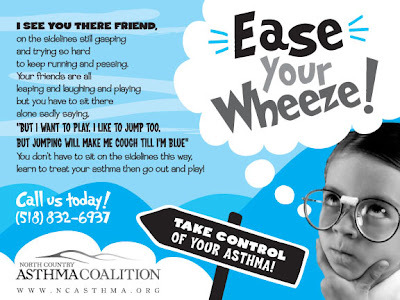 Designed to be kid-friendly, these asthma awareness ads call attention to triggers, symptoms, prevention programs and action plans. After Raeanne developed a campaign brand with a decidedly Seussical bend, Trina took on the copy with the aid of a rhyming dictionary. 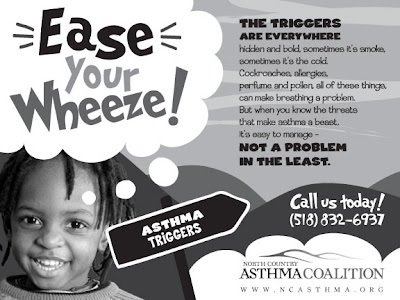 Rae found kids to match Trina's compositions and designed the ads. Raeanne: For a web designer, you sure know how to work a spot color on newsprint. 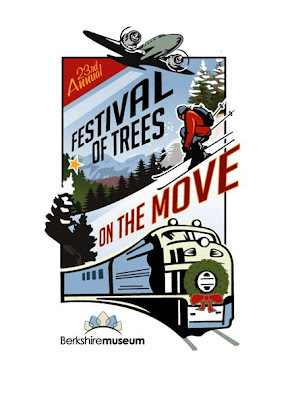 Head to the Berkshires for the 23rd Annual Festival of Trees at the Berkshire Museum. They're decking the halls with some 200 trees in order to celebrate all things on the move: from planes, trains and automobiles to skis, skates and sleds. From November 17 to December 31 visitors can wanted through this enchanted forest and enjoy a model train display, wind-up toys and other vintage holiday favorites. Visit the Museum's website for more information. It's October, believe it or not. That makes it Breast Cancer Awareness Month. 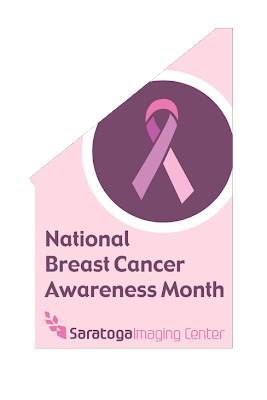 For the second year in a row, Trampoline is proud to design breast cancer awareness banners to hang on Broadway in Saratoga Springs. 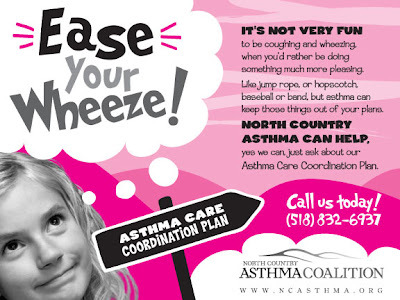 The Saratoga Imaging Center, a Trampoline client, is committed to spreading the word about potentially life-saving scans and simple tests that can aid in early detection. If you're concerned about breast cancer, talk to your doctor. If you're over 40, have an annual mammogram. If you're in the Spa City this October, look up.